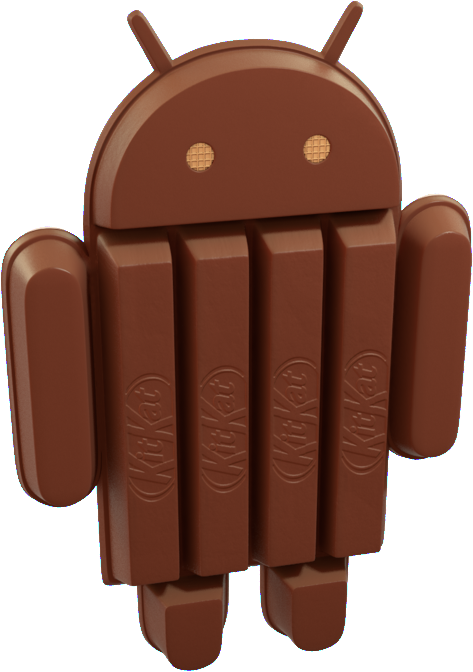 Today we are announcing Android 4.4 KitKat, a new version of Android that brings great new features for users and developers. The very first device to run Android 4.4 is the new Nexus 5, available today on Google Play, and coming soon to other retail outlets. We’ll also be rolling out the Android 4.4 update worldwide in the next few weeks to all Nexus 4, Nexus 7, and Nexus 10 devices, as well as the Samsung Galaxy S4 and HTC One Google Play Edition devices. As part of this release, we kicked off Project Svelte, an effort to reduce the memory needs of Android so that it can run on a much broader range of devices, including entry-level devices that have as little as 512MB RAM. From the kernel to system, frameworks, and apps, we've reduced memory footprint and improved memory management so Android can run comfortably on only 512MB of RAM. We did this not only on Android but across Google apps, like Chrome and YouTube. By supporting a broader range of devices, Android 4.4 will help move the Android ecosystem forward. Now all users will be able to enjoy the very best that Android has to offer, on the devices that best meet their needs. New ways to create beautiful apps — A new full-screen immersive mode lets your app or game use every pixel on the screen to showcase content and capture touch events. A new transitions framework makes it easier to animate the states in your UI. Web content can take advantage of a completely new implementation of WebView built on Chromium. More useful than ever — A printing framework lets you add the convenience of printing to your apps. A storage access framework makes it easier for users find documents, photos, and other data across their local and cloud-based storage services. You can integrate your app or storage service with the framework to give users instant access to their data. Low-power sensors — New hardware-integrated sensors let you add great new features to your apps without draining the battery. Included are a step detector and step counter that let you efficiently track of the number of walking steps, even when the screen is off. New media capabilities — A new screen recorder lets you capture high-quality video of your app directly from your Android device. It's a great new way to create walkthroughs, tutorials, marketing videos, and more. Apps can use adaptive playback to offer a significantly better streaming video experience. RenderScript in the NDK — A new C++ API in the Android Native Development Kit (NDK) lets you use RenderScript from your native code, with access to script intrinsics, custom kernels, and more. Improved accessibility support — New system-wide captioning settings let your apps present closed captions in the style that's preferred by the user. There's a lot more, so be sure to check out the Android 4.4 platform highlights for a complete overview of those and other new capabilities for developers. For details on the APIs and how to use them, take a look at the API Overview or watch one of the new DevBytes videos on KitKat. Along with the new Android 4.4 platform we're releasing a new version of the Android NDK (r9b). The new NDK gives you native access to RenderScript and other stable APIs in Android 4.4, so if you've been waiting to use RenderScript from your native code, give it a try. Last, we've updated the Support Package (r19) with a new helper library for printing images through the new printing framework, as well as other updates. You can get started developing and testing on Android 4.4 right away, in Android Studio or in ADT/Ant. You can download the Android 4.4 Platform (API level 19), as well as the SDK Tools, Platform Tools, and Support Package from the Android SDK Manager. To give users better controls and to provide you with a simple, standard system to continue to monetize your apps, this update contains a new, anonymous identifier for advertising purposes (to be used in place of Android ID). Google Settings now includes user controls that enable users to reset this identifier, or opt out of interest-based ads for Google Play apps. To learn more about Google Play services and the APIs available to you through it, visit the Google Services area of the Android Developers site. 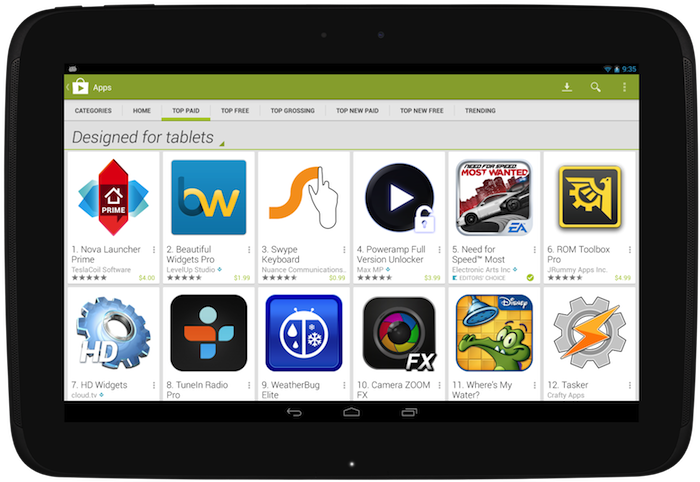 Today we're launching a new release of Google Play services. Version 4.0 includes the Google Mobile Ads SDK, and offers improvements to geofencing, Google+, and Google Wallet Instant Buy APIs. With over 97% of devices now running Android 2.3 (Gingerbread) or newer platform versions, we’re dropping support for Froyo from this release of the Google Play services SDK in order to make it possible to offer more powerful APIs in the future. That means you will not be able to utilize these new APIs on devices running Android 2.2 (Froyo). We’re still in the process of rolling out to Android devices across the world, but you can already download the latest Google Play services SDK and start developing against the new APIs using the new Android 4.4 (KitKat) emulator. If you’re using AdMob to monetize your apps, the new Google Mobile Ads SDK in Google Play services helps provide seamless improvements to your users. For example, bug fixes get pushed automatically to users without you having to do anything. Check out the post on the Google Ads Developer Blog for more details. The Maps and Geofencing APIs that launched in Google Play services 3.1 have been updated to improve overall battery efficiency and responsiveness. You can save power by requesting larger latency values for notifications alerting your app to users entering or exiting geofences, or request that entry alerts are sent only after a user stays within a geofence for a specified period of time. Setting generous dwell times helps to eliminate unwanted notifications when a user passes near a geofence or their location is seen to move across a boundary. The Maps API enhances map customization features, letting you specify marker opacity, fade-in effects, and visibility of 3D buildings. It’s also now possible to change ground overlay images. Apps that are enabled with Google+ Sign-In will be updated with a simplified sign-in consent dialog. Google Wallet Instant Buy APIs are now available to everyone to try out within a sandbox, with a simplified API that streamlines the buy-flow and reduces integration time. Google Wallet Instant Buy also includes new Wallet Objects, which means you can award loyalty points to a user's saved rewards program ID for each applicable Google Wallet Instant Buy purchase. There are many reasons to build or not to build a mobile app as part of your broader mobile strategy. For instance, while apps offer a rich user experience, users can’t access them through Google Search like they do websites. Today, we’re announcing a new Google Search capability, app indexing, that will start to make apps more accessible through Google on Android. Let’s say that a user is searching for a movie. 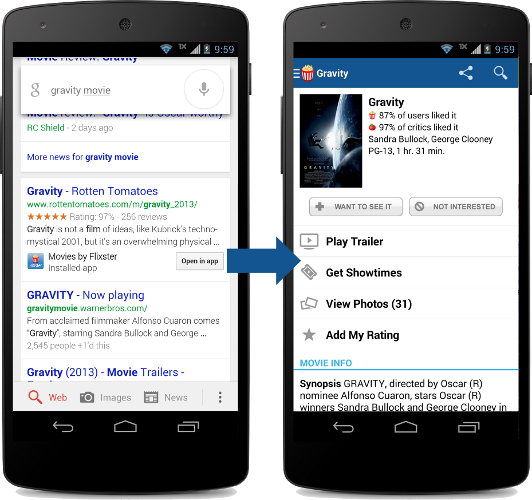 With app indexing, Google will begin to include deep links to apps in Android search results. When the user taps on the “Open in app” deep links, the app opens up directly to the movie in question. The end result is that users will have a seamless search experience when accessing your app content through Google. Google is currently testing app indexing with an initial group of developers including AllTheCooks, AllTrails, Beautylish, Etsy, Expedia, Flixster, Healthtap, IMDb, moviefone, newegg, OpenTable, Trulia, and Wikipedia. Deep links for these applications will start to appear in Google search results on Android, in the US, in a few weeks. If you are interested in enabling indexing for your Android app, you can learn more about our developer guidelines at developers.google.com/app-indexing and sign up. We are expanding our app indexing efforts and will gradually include more developers over time. Sending and receiving SMS messages are fundamental features on mobile devices and many developers have built successful apps that enhance this experience on Android. Some of you have built SMS apps using hidden APIs—a practice we discourage because hidden APIs may be changed or removed and new devices are not tested against them for compatibility. So, to provide you with a fully supported set of APIs for building SMS apps and to make the user experience for messaging more predictable, Android 4.4 (KitKat) makes the existing APIs public and adds the concept of a default SMS app, which the user can select in system settings. This means that if you are using the hidden SMS APIs on previous platform versions, you need to make some adjustments so your app continues to work when Android 4.4 is released later this year. On Android 4.4, only one app can receive the new SMS_DELIVER_ACTION intent, which the system broadcasts when a new SMS message arrives. Which app receives this broadcast is determined by which app the user has selected as the default SMS app in system settings. 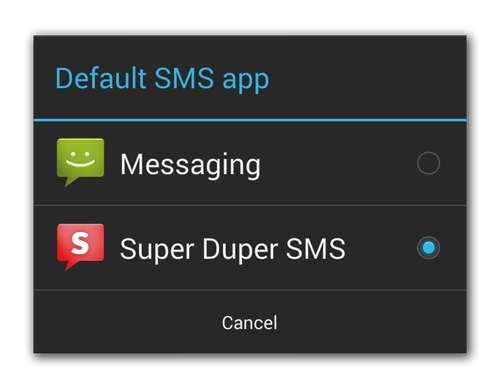 Likewise, only the default SMS app receives the new WAP_PUSH_DELIVER_ACTION intent when a new MMS arrives. Other apps that only want to read new messages can instead receive the SMS_RECEIVED_ACTION broadcast intent when a new SMS arrives. However, only the app that receives the SMS_DELIVER_ACTION broadcast (the user-specified default SMS app) is able to write to the SMS Provider defined by the android.provider.Telephony class and subclasses. As such, it's important that you update your messaging app as soon as possible to be available as a default SMS app, because although your existing app won't crash on an Android 4.4 device, it will silently fail when attempting to write to the SMS Provider. In a broadcast receiver, include an intent filter for SMS_DELIVER_ACTION ("android.provider.Telephony.SMS_DELIVER"). The broadcast receiver must also require the BROADCAST_SMS permission. This allows your app to directly receive incoming SMS messages. In a broadcast receiver, include an intent filter for WAP_PUSH_DELIVER_ACTION ("android.provider.Telephony.WAP_PUSH_DELIVER") with the MIME type "application/vnd.wap.mms-message". The broadcast receiver must also require the BROADCAST_WAP_PUSH permission. This allows your app to directly receive incoming MMS messages. In your activity that delivers new messages, include an intent filter for ACTION_SENDTO ("android.intent.action.SENDTO") with schemas, sms:, smsto:, mms:, and mmsto:. This allows your app to receive intents from other apps that want to deliver a message. In a service, include an intent filter for ACTION_RESPONSE_VIA_MESSAGE ("android.intent.action.RESPOND_VIA_MESSAGE") with schemas, sms:, smsto:, mms:, and mmsto:. This service must also require the SEND_RESPOND_VIA_MESSAGE permission. This allows users to respond to incoming phone calls with an immediate text message using your app. Any filters for the SMS_RECEIVED_ACTION broadcast in existing apps will continue to work the same on Android 4.4, but only as an observer of new messages, because unless your app also receives the SMS_DELIVER_ACTION broadcast, you cannot write to the SMS Provider on Android 4.4. Beginning with Android 4.4, you should stop listening for the SMS_RECEIVED_ACTION broadcast, which you can do at runtime by checking the platform version then disabling your broadcast receiver for SMS_RECEIVED_ACTION with PackageManager.setComponentEnabledSetting(). However, you can continue listening for that broadcast if your app needs only to read special SMS messages, such as to perform phone number verification. Note that—beginning with Android 4.4—any attempt by your app to abort the SMS_RECEIVED_ACTION broadcast will be ignored so all apps interested have the chance to receive it. Tip: To distinguish the two SMS broadcasts, imagine that the SMS_RECEIVED_ACTION simply says "the system received an SMS," whereas the SMS_DELIVER_ACTION says "the system is delivering your app an SMS, because you're the default SMS app." In consideration of some apps that do not want to behave as the default SMS app but still want to send messages, any app that has the SEND_SMS permission is still able to send SMS messages using SmsManager. 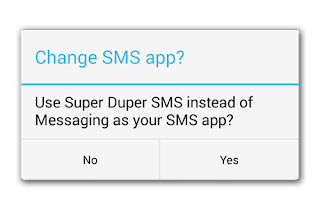 If and only if an app is not selected as the default SMS app on Android 4.4, the system automatically writes the sent SMS messages to the SMS Provider (the default SMS app is always responsible for writing its sent messages to the SMS Provider). However, if your app is designed to behave as the default SMS app, then while your app is not selected as the default, it's important that you understand the limitations placed upon your app and disable features as appropriate. Although the system writes sent SMS messages to the SMS Provider while your app is not the default SMS app, it does not write sent MMS messages and your app is not able to write to the SMS Provider for other operations, such as to mark messages as draft, mark them as read, delete them, etc. So when your messaging activity resumes, check whether your app is the default SMS app by querying Telephony.Sms.getDefaultSmsPackage(), which returns the package name of the current default SMS app. If it doesn't match your package name, disable features such as the ability for users to send new messages. When the user decides to use your app for messaging, you can display a dialog hosted by the system that allows the user to make your app the default SMS app. To display the dialog, call startActivity() with the Telephony.Sms.Intents.ACTION_CHANGE_DEFAULT intent, including an extra with the Sms.Intents.EXTRA_PACKAGE_NAME key and your package name as the string value. // App is not default. // App is the default. Query the current default SMS app's package name and save it. Request the user change the default SMS app to your app in order to restore SMS messages (you must be the default SMS app in order to write to the SMS Provider). 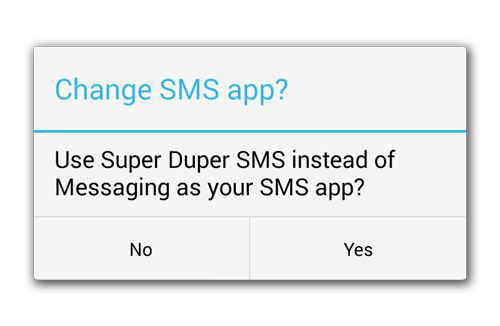 When you finish restoring all SMS messages, request the user to change the default SMS app back to the previously selected app (saved during step 1). We encourage you to update your apps as soon as possible to provide your users the best experience on Android. To help you make the changes, we'll soon be providing the necessary SDK components for Android 4.4 that allow you to compile and test your changes on Android 4.4. Stay tuned! Mobile games are on fire right now; in fact, three out of every four Android users are playing games. Earlier in the year we launched Google Play Games — Google’s platform for gaming across Android, iOS, and the web — to help you take advantage of this wave of users. Building on Google Play Services, you can quickly add new social features to your games, for richer game experiences that drive user acquisition and engagement across platforms. Today we’re announcing three new features in Google Play Games that make it easier to understand what players are doing in your game, manage your game features more effectively, and store more game data in the Google cloud. Now you can see stats about your game’s player activity in Google Play Games right in the Google Play Developer Console. You can see how many players have signed into your game through Google, the percentage of players who unlocked an achievement, and how many scores are posted to your leaderboards. Did you mangle the ID for an achievement or leaderboard? Forget to hit the publish button? Do you know if your game is getting throttled because you accidentally called a method in a tight loop? Fear not! New alerts will now show up in the Developer Console to warn you when these mistakes happen, and guide you quickly to the answers on how to fix them. Cloud Save is one of our most popular features for game developers, providing up to 512KB of data per user, per game, since it was introduced. You asked for more storage, and we are delivering on that request. Starting October 14th, 2013, you’ll be able to store up to 256KB per slot, for a total of 1MB per user. Game saves have never been happier! If you want learn more about what Google Play Games offers and how to get started, take a look at the Google Play Games Services developer documentation. A key part of growing your app’s installed base is knowing more about your users — how they discover your app, what devices they use, what they do when they use your app, and how often they return to it. Understanding your users is now made easier through a new integration between Google Analytics and the Google Play Developer Console. Starting today, you can link your Google Analytics account with your Google Play Developer Console to get powerful new insights into your app’s user acquisition and engagement. In Google Analytics, you’ll get a new report highlighting which campaigns are driving the most views, installs, and new users in Google Play. In the Developer Console, you’ll get new app stats that let you easily see your app’s engagement based on Analytics data. This combined data can help you take your app business to the next level, especially if you’re using multiple campaigns or monetizing through advertisements and in-app products that depend on high engagement. Linking Google Analytics to your Developer Console is straightforward — the sections below explain the new types of data you can get and how to get started. 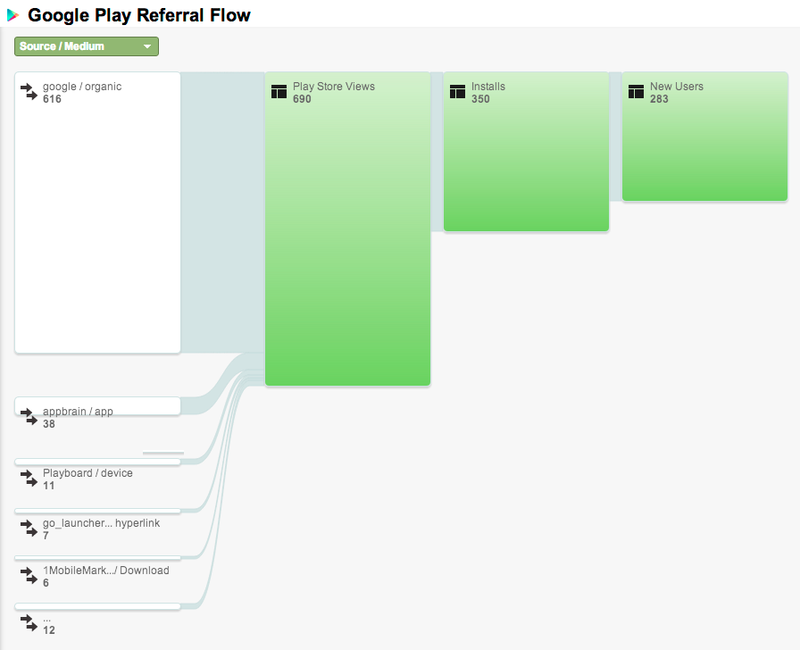 Once you’ve linked your Analytics account to your Developer Console, you’ll see a new report in Google Analytics called Google Play Referral Flow. This report details each of your campaigns and the user traffic that they drive. For each campaign, you can see how many users viewed listing page in Google Play and how many went on to install your app and ultimately launch it on their mobile devices. With this data you can track the effectiveness of a wide range of campaigns — such as blogs, news articles, and ad campaigns — and get insight into which marketing activities are most effective for your business. You can find the Google Play report by going to Google Analytics and clicking on Acquisitions > Google Play > Referral Flow. 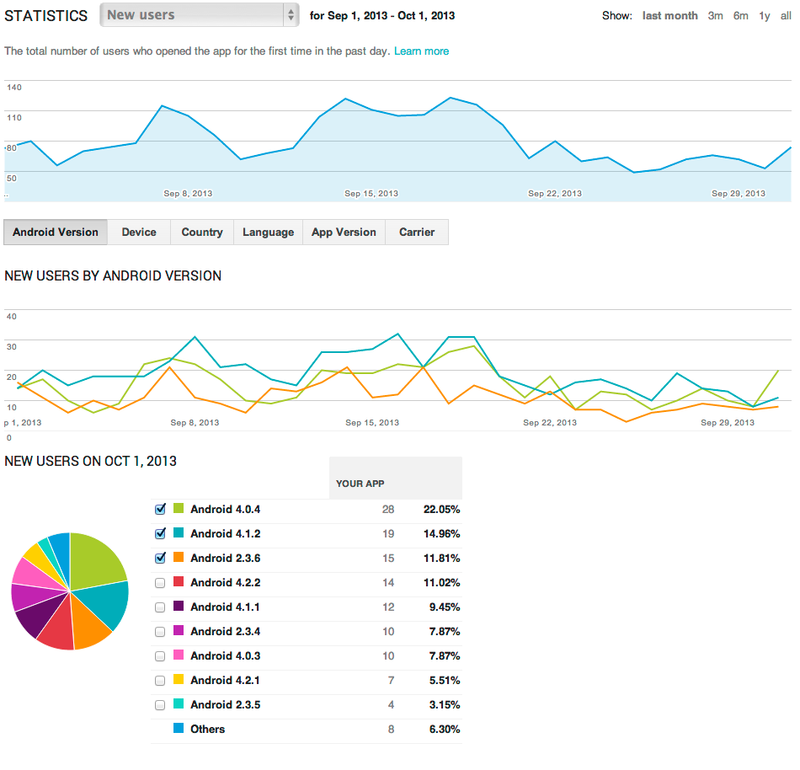 If you’re already using Google Analytics, you know how important it is to see how users are interacting with your app. How often do they launch it? How much do they do with it? What are they doing inside the app? These engagement metrics are integrated with your other app statistics, so you can analyze them further across other dimensions, such as by country, language, device, Android version, app version, and carrier. To get started, you first need to integrate Google Analytics into your app. If you haven’t done this already, download the Google Analytics SDK for Android and then take a look at the developer documentation to learn how to add Analytics to your app. Once you’ve integrated Analytics into your app, upload the app to the Developer Console. Next, you’ll need to link your Developer Console to Google Analytics. To do this, go to the Developer Console and select the app. At the bottom of the Statistics page, you’ll see directions about how to complete the linking. The process takes just a few moments. That’s it! You can now see both the Google Play Referral Flow report in Google Analytics and the new engagement metrics in the Developer Console.